The Janome QXL605 Is a sewing and quilting machine, it’s fully computerised and is suitable for experienced sewers and quilters. This machine is useful for quilting and heirloom plus general sewing. 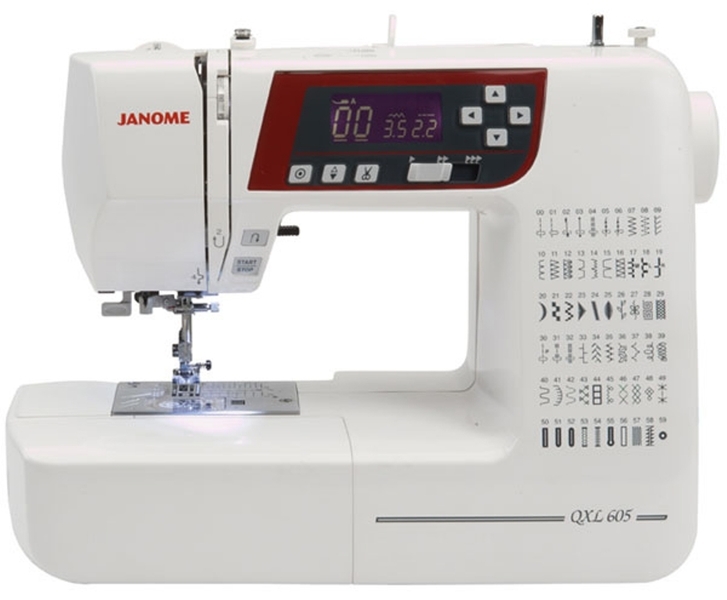 The LCD Information screen shows the stitches and the stitch length and width which are fully changeable; the Janome QXL605 also has 60 automatic stitches including 7 different automatic buttonholes. The Janome QXL605 has a jam proof, top loading bobbin. The full rotary hook system also eradicates the need for a removable bobbin case. The hook cover plate opens at the touch of a button, and the extra needle penetration power of the Janome QXL605 lets you sew across heavier fabrics & multiple layers. The Janome QXL605 can handle all types of fabrics from silks and cottons to tougher materials such as multiple layers of denims and soft leather. This machine also includes a seven piece feed mechanism; a drop feed facility, automatic needle threader for easier threader, a slide speed control for more intricate work and comes complete with a hard cover for protection of your machine. I actually rate this item quite highly after having had other makes. However it was interesting to read of someone having problems with the bobbin case. I have since my purchase many years ago had to replace this part at least 6 times!!... I have never experienced a continuous problem such as this before.... so... am not a happy bunny!!... coukd this be a manufacturing fault?? I love this item, so many different things you can do with it. My favorite feature you can use the item without the foot pedal! I am amazed at what it can do, I would recommend to everyone! I have now had this item for some months and since the bobbin case was replaced I cannot fault it. The down side is when you switch it off you then would have to re-programme the stitches you previously used. It does not remember your previous stict. Post it notes are great for this. Generally the item is great. How I agree with the previous post! I had to change my original bobbin case two weeks after buying the item after I attempted some free motion quilting. That cost me another £20 but luckily my sewing shop allowed me to have it at cost price. I like the item in general but the tension problems are just too difficult at times. You have to adjust the dial almost to 1 before it starts to be possible to achieve a good stitch when free motion stitching. I\'m now considering a bernina and swapping this in part exchange. Would not recommend it. I have had this item for a couple of hours and then the bobbin case started to jump out of alignment. 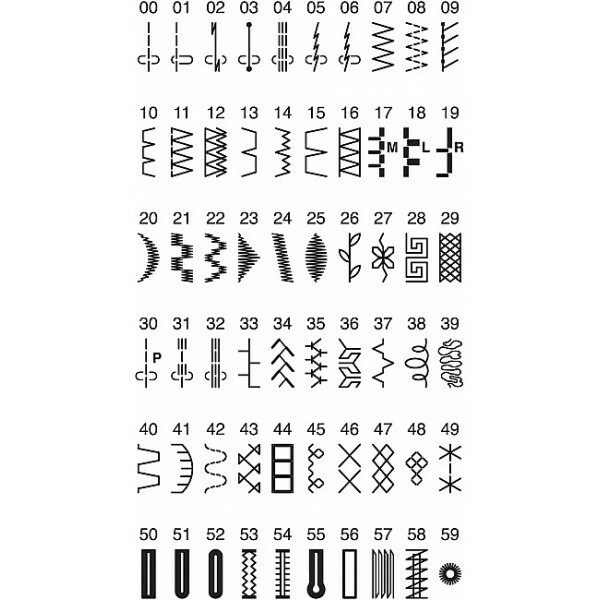 After 40 years of sewing I know what I am doing so knew that I was threading the item correctly. I also read the manual from cover to cover and looked at threading instructions on the internet which confirmed I was doing ok. However this item has been back to the retailer and now they are going to replace it. I am not that confident that all will be ok, although I hope it will. No item should be this fussy. I have always owned Janome in the past and have been pleased with them. When the needle hits the bobbin case turning it into swiss cheese this is not right. I have reservations about this item, only time will tell when the replacement arrives. So far not impressed.